Vladislav Mamyshev-Monro "Члены Политбюро / Members of the Politburo"
Vladislav Mamyshev-Monro is well-known for his reworked posters of "Members of the Politburo". Official posters of the upper class of the Soviet nomenklatura were printed for a mass public in large editions and sold at bookstores for a nominal price. Whether they were actually bought by the target audience remains a matter for speculation, but in the case of Mamyshev they proved to greatly stimulate his artistic imagination. 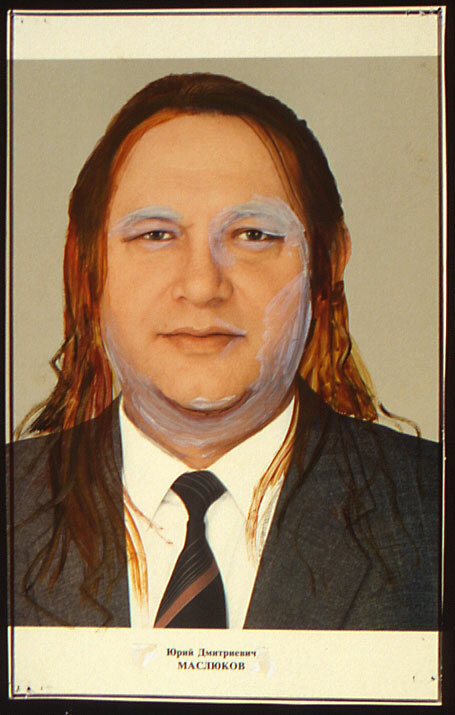 In 1990, he offered ten of these posters with a dedication to "beloved artist Evgenij Kozlov", and it is highly likely that these were his first embellished Politburo posters. All politicians belonged to the 27th Politburo of the Communist Party of the Soviet Union. 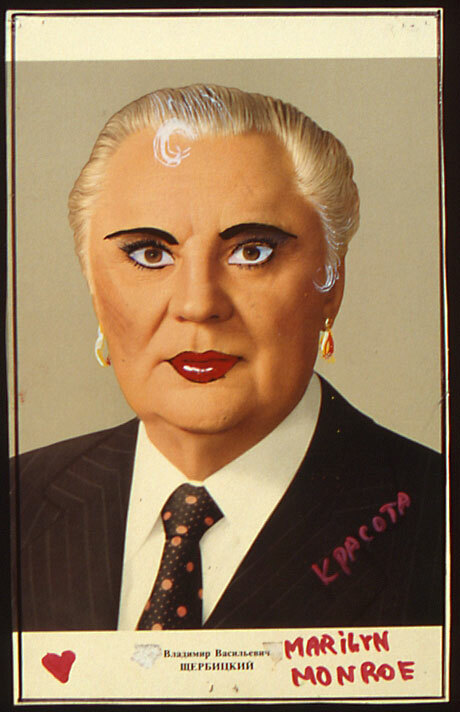 It lasted from 6 March 1986 to 14 July 1990, the main period of perestroika. The 28th Politburo ended when the Communist Part was dissolved on 29 August 1991. "Love for the Cosmos", oil on canvas, 2x3m, 1990, from the cycle "New Classicals". Photo: (E-E) Evgenij Kozlov, early 1990. 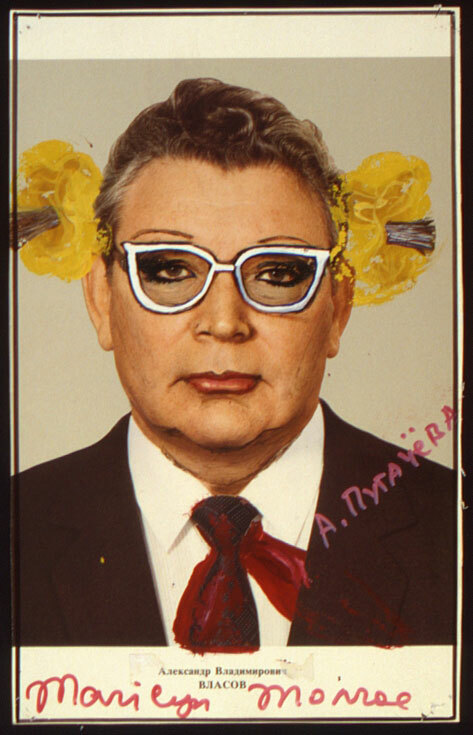 However, Mamyshev's transformations of the Politburo members are carried out in a more light-hearted spirit. 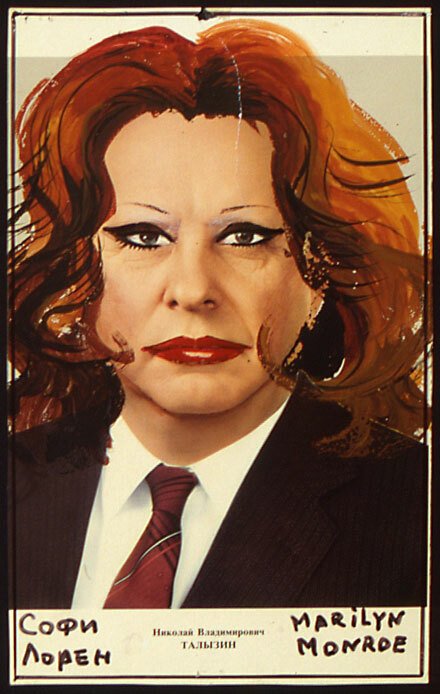 They give evidence to his pleasure in feminising a boring and unattractive male world deprived of charm or elegance and show how easily this can be adjusted! 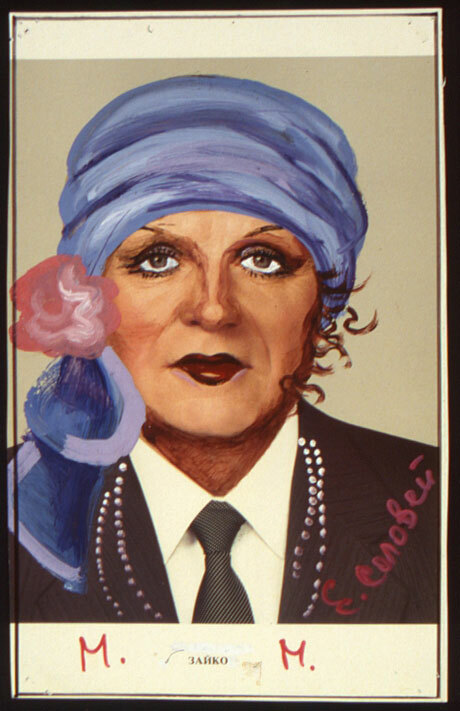 The role models for these transformations are famous actresses and singers, notably from the West, such as Gina Lollobrigida and Sofia Loren, but also Alla Pugacheva, a star in Mamyshev's own country. 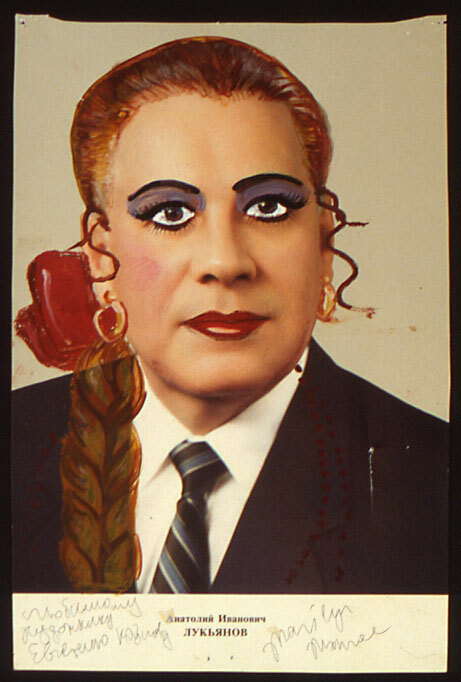 When we look at the politicians, we notice that they remain bureaucrats albeit now disguised with heavy makeup and glamorous hairdos. 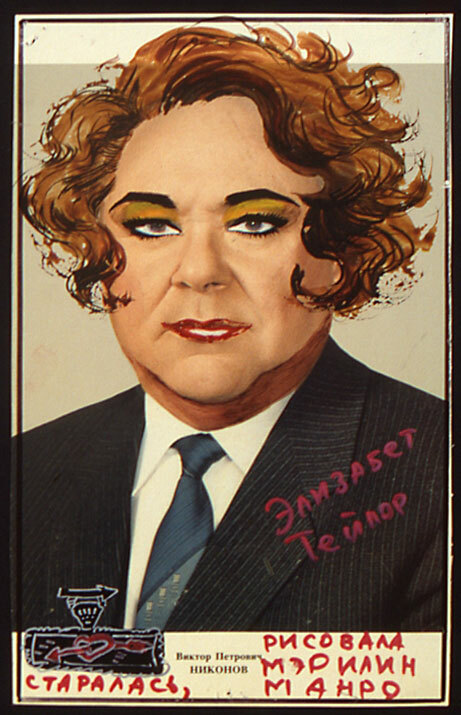 For instance, Viktor Petrovich Nikonov, deputy minister for Agriculture of the Soviet Union, was in his mid-fifties when he suddenly became Elisabeth Taylor, by the will of Vladislav Mamyshev, who signed the poster with "I did my best, I, Marilyn Manroe, painted it". These less-than-perfect transformations are funny in their innocent appeal. Evgenij Kozlov hung them in a corner of his studio ,next to his painting "Love for the Cosmos", which was later replaced by "Love for the Wonderful“. 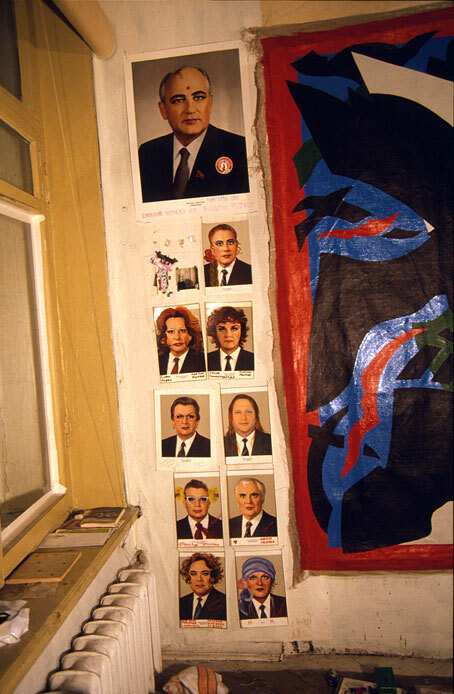 They were arranged in pairs, and the largest poster, with Gorbachev, leader of the Soviet Union between 1985 and 1991, was on top. In orthodox Russian homes, one of the corners of a room is the "red corner" (krasnyi ugol), a sacred place traditionally reserved for icons. The Soviet propaganda tried to substitute worship with socialist zeal, and Kozlov's hanging was an ironic comment on this profane "cult of personality". 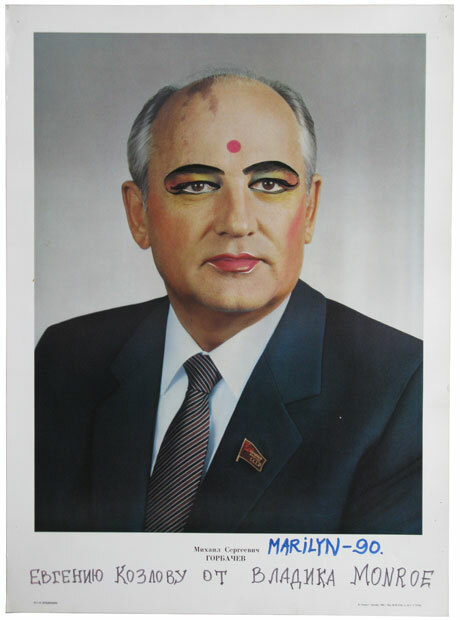 By the way, unlike Mikhail Gorbachev, many former colleagues of the "General Secretary of the Central Committee of the Communist Party of the Soviet Union" continued their political career after 1991, although, we may assume, without official posters. In 1991, nine of 10 posters (M. Gorbachev being omitted) went to the exhibition "Geopolitika", where they were presented as "Eminent Scholars of Monrology". 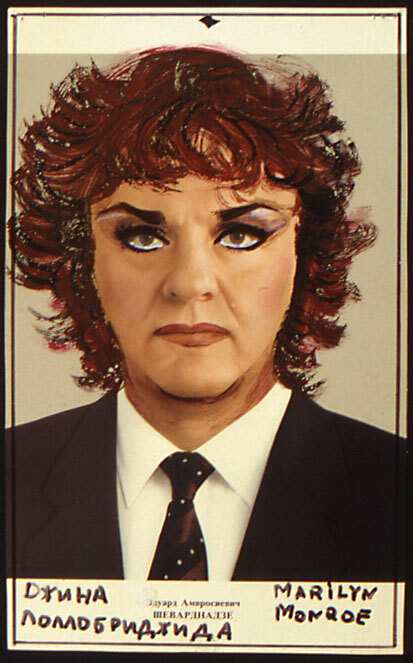 "Члены политбюро" / "Members of the Politbureau"
mixed media, offset print, paper, 1990. Gift to Evgenij Kozlov by the artist.